(CNN) -- Pakistan will send a representative of its intelligence agency to India to help investigate the attacks in Mumbai, but not the agency's chief as previously indicated, the office of Pakistan's prime minister said Saturday. 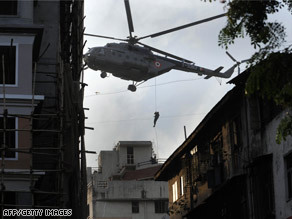 An Indian commando rappels from a helicopter Friday above Mumbai's Chabad House. This week, Indian Prime Minister Manmohan Singh asked his Pakistani counterpart to send Pakistan's intelligence chief, saying preliminary investigations indicated that the Mumbai gunmen came from Pakistan's largest city, Karachi, according to Pakistani authorities. Pakistani Prime Minister Yousuf Raza Gilani agreed to send the intelligence chief, Gilani's office initially said. Two former Pakistan intelligence chiefs told CNN that such an agreement between the nuclear-armed rivals would have been unprecedented. But Saturday morning in Pakistan, a news release from Gilani's office said "a representative of [the intelligence agency] will visit India instead." The release didn't indicate the reason for the reversal. Pakistani officials have said it is too early to say where the attackers came from, and Karachi police have said they have no evidence that the attackers departed from their city. "These are the actions of non-state actors," Haqqani said. "It's time for us to united in the war against terror." Who is to blame for Mumbai attacks? Haqqani noted that Pakistan knows "how it feels to be a victim of terrorism," noting that former Prime Minister Benazir Bhutto, the wife of current President Asif Ali Zardari, was assassinated last year. "We are both victims, and our heart goes out to our neighbors," Haqqani said. On Thursday, Gilani told CNN that the attacks were "a heinous crime, and we condemn it." "I think this terrorism is a menace for the whole world, and therefore we have to work jointly to combat terrorism and extremism," Gilani said. One of the former Pakistani intelligence chiefs told CNN that sending the country's current intelligence boss to India would be a sign of weakness. Officially, Indian authorities have said that no one has claimed responsibility for the attacks that left at least 160 dead in southern Mumbai, although a group called the Deccan Mujahideen took credit in e-mails to Indian news outlets. Indian officials have indicated that the gunmen came from Pakistan. "The preliminary investigation indicates that some elements in Pakistan are involved," said Pranab Mukherjee, India's foreign minister. "I can't tell you the details since the investigation is going on," he said. "Until the investigation is complete, it will be difficult to say where they came from and how they came." The Mumbai attacks came at at time when India and Pakistan were making unprecedented efforts to improve relations. This week, officials with both countries' interior ministries met in Islamabad. Also, Pakistan's foreign minister recently traveled to India to hold talks. Mahmood Shah, a former officer in the Pakistani military who serves as a political analyst for Pakistani TV stations, told CNN that it appeared unlikely that Pakistan's government would have been involved in the attacks. "I think the relations are getting improved, so at this point in time, those who say it was Pakistan, I think ... this is a little bit more than Pakistan's capability to create that sort of a thing in Mumbai," Shah said. "In fact, neither the timing is very suitable, nor do I think Pakistan would like to do such a thing."